Middleton Manigault was a member of the emerging Modernist movement in America. This scene was probably inspired by the many displays of fireworks that were staged along the Hudson River, in the autumn of 1909, to honor both the discovery of the river by Henry Hudson in 1609 and the first navigation of the river by a steamboat, Robert Fulton’s Clermont, in 1807. 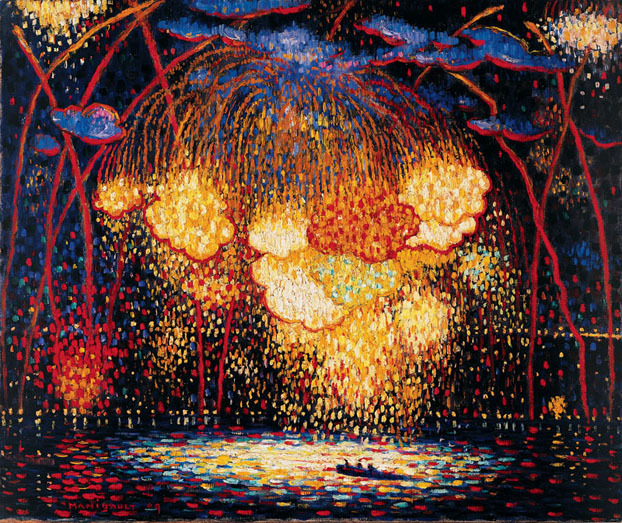 In this work, separate strokes of brilliant color convey the intense visual impact of a shower of fireworks over the river. A painting of great vibrancy and distinct originality, this work demonstrates the power of Manigault’s imagination and his instincts for color, which he derived from post- Impressionism in the early years of his career. I hope all my American readers had a Glorious Fourth! (I’m assuming not all of you are Americans…I could be wrong in this) It rained on and off here, which lead to a crazy packed movie theater. 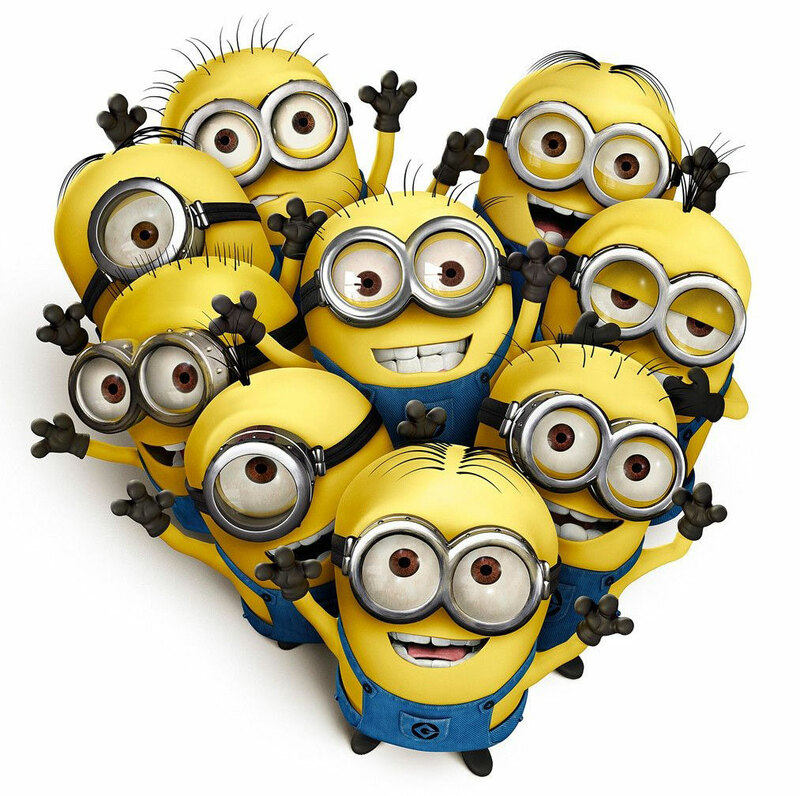 My brother, his girlfriend and I went to see Despicable Me 2, because sometimes you need minions in your life. If you haven’t seen the first one, that’s OK. This isn’t a movie that requires you to have seen the first one, although I do recommend it, just because it’s super-cute. Tech week is where all the parts of the show come together: lighting, any special effects, costumes, scenery, music from the pit. Everything at one time. Now, we have really been ahead of the game this year in that we’ve been doing lights, moving scenery and props in and out of the scenes, and even incorporating some costumes, for the past week. So I think it will go more smoothly than tech usually goes for a show of this size. At least I’m hoping so. We start at 9 AM and go until we’re done. People usually bring lots of food so we can fortify ourselves when we’re not on stage. 🙂 I probably won’t be in full costume tomorrow–just some pieces, but will start full costume next week. We’ve got a pretty quick change between “At the End of the Day” and “Lovely Ladies”–just “I Dreamed A Dream” is between them–and the LL costumes are fairly elaborate. Speaking of LL costumes–yesterday I made my hat! I’ll have pictures up later, but basically I took a star hat frame and added a ribbon, feathers, and a cluster of flowers. It’s so adorable. I love it! Maybe I should’ve been a milliner? Pope Francis’ first encyclical is out today. Read it here. It’s been called and encyclical written “with four hands”, because B XVI began it, so I’m really interested to read the final result. 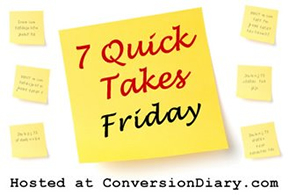 (Which I will do after this is up) In other church news: two new Saints! Bl. John Paul II and Bl. John XXIII are going to be canonized. Rock on! Books I read this week: Kisses from Katie; started Jane Austen: A Life In Small Things, and Love Walked In. Monday and Tuesday are my annual testing-palooza at the resort (AKA Nationwide Children’s). Let the fun begin! I’m sure most of the tests will be fine; I’ve been feeling great. But one never knows.